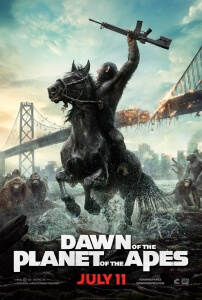 If the 2011 franchise reboot Rise of the Planet of the Apes wasn’t enough to make you forget about Tim Burton’s infamously woeful remake ten years prior, then Dawn of the Planet of the Apes should throw all existing memory of it back into the executive’s think tank from whence it came. Not so much a sequel as it is a continuation of the newly-established timeline introduced in Rise, Dawn far outpaces its predecessor by a long shot with its heavier focus on story, character and, above all, emotional weight. This can be narrowed down to the impressive direction by Matt Reeves – taking over from Rise director Rupert Wyatt – who manages to approach every major plot point with the perfect balance of suspense and surprise, all in all making for a more exciting experience – though there’s not an immediate equivalent to the awesomeness of Caesar’s (Andy Serkis) first word in Rise. In addition, the action sequences, particularly a later siege in the abandoned streets of San Francisco – looking like a blend of The Walking Dead and I Am Legend in terms of post-apocalyptic cities – are wonderfully handled and shot, especially a POV shot of a tank taken over by one of the apes during battle. Reeves’ past experience on films like Cloverfield have definitely helped him shape his appetite for high-concept action, and especially how it can be used in the most effective ways possible. Reeves also has the delight of working off an intelligent and insightful script by Mark Bomback (The Wolverine) and returning Rise writers Rick Jaffa and Amanda Silver, who all work together to create a tightly-paced story that works just as well as a standalone film in addition to it being part of a bigger, longer narrative (or at least that’s what the intentionally-open ending strongly implies). One of the biggest themes they give to the film is that of leadership – the strengths of it, the abuse of it, and the constant clashing of ideologies that either benefit or endanger it. If you want to get really academic about it, then you can even make the argument that certain characters and their motives are allegorical reflections of early 20th-century Russia – not unlike George Orwell’s Animal Farm, another anthropomorphic work of fiction. If Caesar, the founder and leader of his ape society, is Lenin then Toby Kebbell’s antagonistic primate Koba, driven by a power complex and a desire for anarchy and supreme power above sticking to the original ideology, is undoubtedly Stalin. It’s proof that these writers certainly did their homework, adding layers to a well-told story with good dialogue and strong characters. The latter, in particular, are brought to life in exceedingly impressive performances by both its human and motion-capture casts. But while the CGI does a fantastic job as ever in creating near lifelike creatures to the screen without a whiff of the uncanny valley, it really is the performers who bring the apes to life. Serkis continues to dazzle as Caesar, commanding the screen with a wise presence and a steady display of leadership that makes his character easy to root for all throughout the film. Kebbell, meanwhile, is a great villain to be both terrified of and be sympathetic towards (the latter thanks to his borderline abuse by humans in past experiments) and it is clear, even behind all that impressive CG trickery, that he’s having a blast with it. Other mo-cap performances to highlight: relative newcomer Nick Thurston truly shines as Caesar’s teenage son Blue Eyes, and most of the scenes he gets to share with his on-screen father are ripe with emotion and raw innocence that lend the character a confused yet wide-eyed personality; as another returning actor from Rise, Karin Konoval – as gentle orang-utan Maurice – gets more screen time and thus more things to do in a scene-stealing role where her character hardly even speaks an audible word aside from subtitled sign language; but unfortunately, it’s Judy Greer who gets the shorter end of the stick with a woefully-underwritten part as Caesar’s wife Cornelia, and for anyone who saw and loved the talented actress’s work on projects like The Descendents or Archer will be sorely disappointed by her limited presence here. On the human side of the cast, Jason Clarke is a fine leading (human) man while Gary Oldman has fun playing things fairly straight as a character who could have been so tired and clichéd in the hands of a lesser writer or actor. Keri Russell and Kodi Smit-McPhee, as Clarke’s wife and son respectively, are not given as much room to flex out their characters (though Smit-McPhee – a previous associate of Reeves due to his role in his 2010 film Let Me In – is given less to do than Russell, because at least she uses her character’s medical training to help certain characters), and everyone else with a line is either a minor extra or just there to get slaughtered by manic, ravaging apes. As you can probably tell, Dawn of the Planet of the Apes is mostly the apes’ show through and through – but when they’re this effective and just as strongly developed as their homo sapien counterparts then it’s very much welcome. Dawn of the Planet of the Apes is a smart and dramatically engaging summer blockbuster that expands and improves on its predecessor while also telling its own competent story, with the combination of tight direction, thoughtful writing, impressive CG/motion-capture artistry and breathtaking performances by Andy Serkis et al making it an even more rewarding experience.